Eco Citizen is merging fashion consciousness and social consciousness with clothing like this t-shirt. As the owner of Eco Citizen, Joslin Van Arsdale directs the flow of organic and sustainable fashion products from designers to manufacturers and ultimately to us, the consumer. Van Arsdale’s background in fashion, photography, and art culminates in her personal contribution to the merchandise offered in the store. 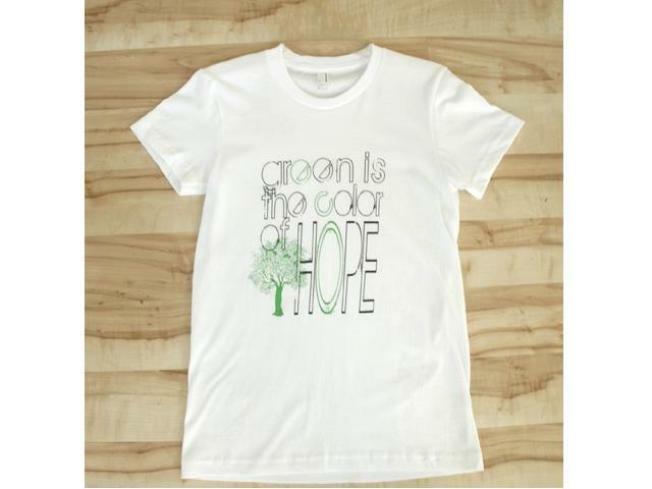 Take her fresh, modern statement t-shirt: "GREEN is the COLOR of HOPE." It's just one example of how Van Arsdale effortlessly links social consciousness and fashion consciousness. Most pieces at Eco Citizen sell for $24 to $300. My favorite line of separates is SUST, a socially savvy line of clothing. It's even owned and operated by a local team, FOB Redwood City. The SUST collection is packable for travel, comfortable for play, stylized for first impression encounters and just so happens to be machine washable. The colors encourage creativity in mixing and matching. SUST uses only US organically grown cotton, so layer it for cool weather days and wear it simple for dinner dates. Several pieces of SUST roll up easily to tuck into a tote for a weekend getaway or business trip. Oh, and don't forget their popular scarf offering in an array of flattering colors. It's soft and wraps around once, twice or three times, perfect for those breezy San Francisco days.